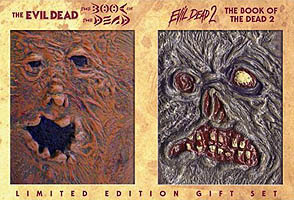 The Evil Dead 1 & 2 Double Book Limited Edition Gift Set comes packaged in a special leather-like case that simulates the original leather bound book featured in all three movies. The set is being released as a limited edition, and it will be in short supply. Bonus trailers: "Man with the Screaming Brain", "Dead & Breakfast", and "Evil Dead: Regeneration (video game)"
The Medieval Ash by NECA is from their Cult Classics Series 5 collection. Ash is fully articulated and stands 7" tall. Accessories include a shotgun (boomstick to all you primative screwheads), alternate "stretch" head, and "grave" display base. "In an age of darkness. At a time of evil. When the world needed a hero. What it got was him." 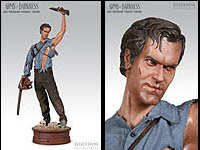 Here is the rare "Evil Ash" collectible from Sideshow that is hard if not impossible to find. This 12" figure features an amazing likeness of Evil Ash with awesome detailing! The head comes with a fixed Skull helmet and rooted hair. The costume consists of a rib boned breastplate, shoulder armor, elbow armor, forearm plates and evil cape with skull clasps from the final battle sequence. The figure will also come with a sword and scabbard, waist belt, cut up Medieval shirt and trousers, wristwatch, hiking boots and a display base. Army of Darkness fans are in for a treat! Today Sideshow Collectibles made their Ash Premium Format figure available for pre-order. Ash is 22 inches tall standing on a detailed display base featuring Deadite debris. 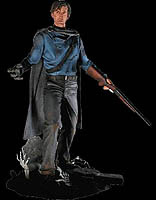 As with all their collectibles, the Sideshow artists/sculptors have captured an awesome likeness of Bruce Campbell. He is cast in high quality polystone and features real fabric clothing with chest rig and holster. If you hurry, you may be one of the lucky ones able to reserve the Exclusive which comes with a Necronomicon [Book of the Dead] accessory. "1 Man, 1 Million dead, The odds are just about even."